1.Ten Year Treasury Yield….Spike After Election then 4 Months Sideways. Who would have thought that after the Fed hiked rates for the second time in three months that Treasury yields would actually decline? But that’s exactly what’s happened. 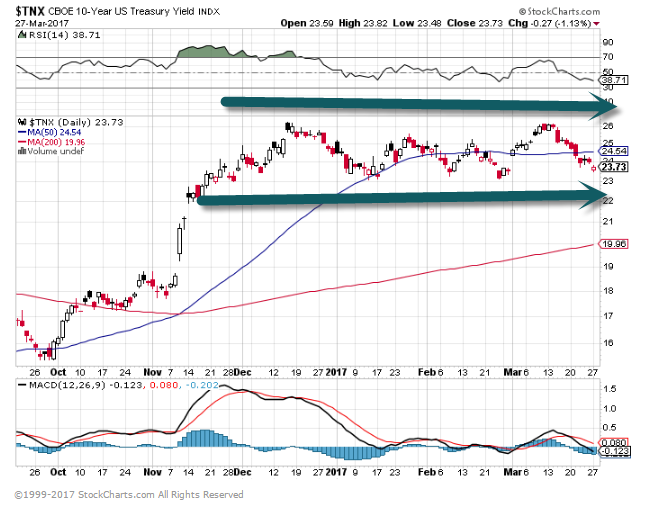 The 10-year U.S. Treasury bond yield dropped from 2.6% on the day before the March 15 decision to 2.4% now, confounding many investors who had expected rates to continue climbing. However, one person who’s not surprised is bond guru Jeffrey Gundlach. In a webcast that took place earlier this month, he predicted rates would go lower before they went higher, something that seems to be playing out in the markets right now. 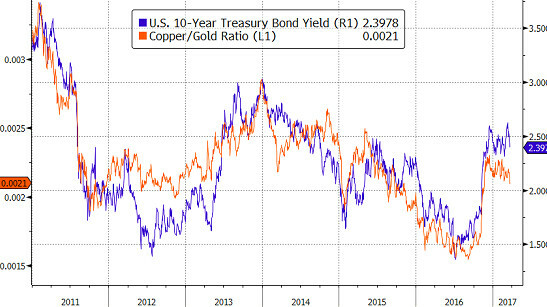 In his presentation, Gundlach forecasted that there would be a tradable rally in the 10-year bond, which would push the yield to below 2.25% (bond prices and yields move inversely). He pointed to record short positions in Treasuries as fuel for the countertrend rally. But even as rates decline in the short term, don’t expect it to last. 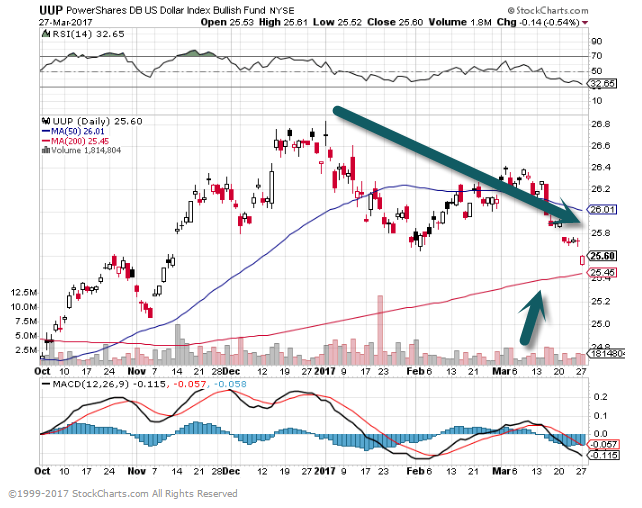 The founder of DoubleLine Capital, with more than $100 billion in assets under management (AUM), said that once this oversold rally in bonds is over, the sell-off will resume and rates will move higher. He still expects the 10-year to jump to around 3% later this year. 3.Volatility…DOW Down 8 Days in a Row? 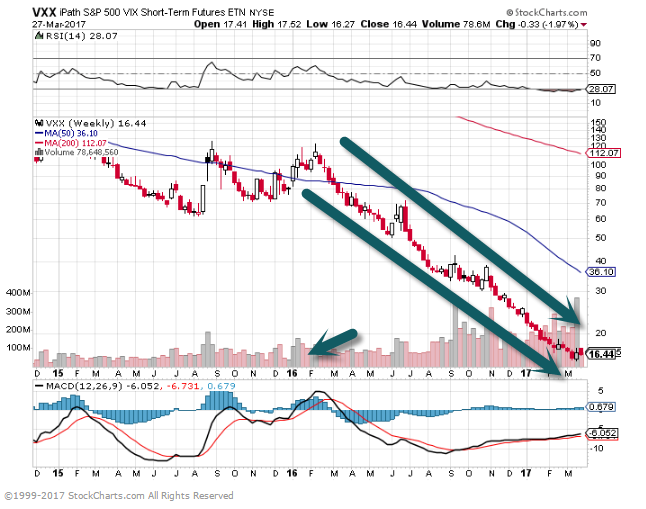 4.Follow up to my Recent Comments on International Markets. 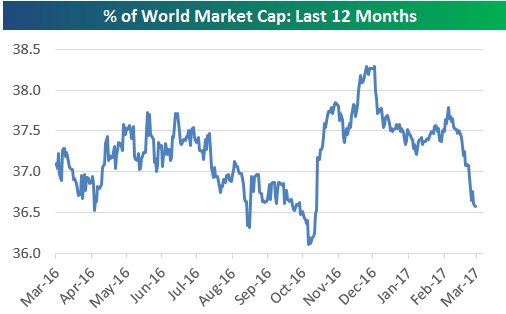 Below is a one-year chart showing the percentage of total world equity market capitalization that the US stock market makes up (from Bloomberg‘s world market cap indices). Heading into the 2016 Presidential Election, the US was losing market share to the rest of the world. But following President Trump’s victory, this reading shot up from just over 36% to nearly 38.5%. That’s a huge move. Since peaking at the end of 2016, however, we’ve seen a steady drift lower down to just above 36.5%. 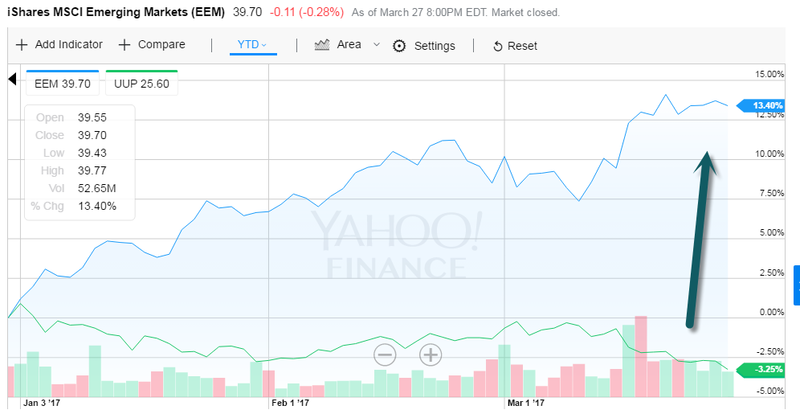 At this point the US has only gained a very small % of share in world market cap since Trump’s victory night. 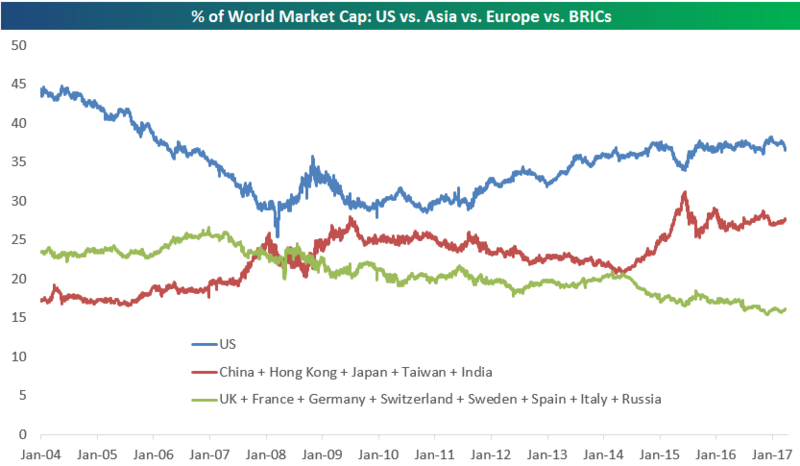 Below is chart that highlights shifts in world market cap since 2004 for the US, Europe, and Asia. As you can see, from 2004 through mid-2007, Europe had the second highest share of world market cap behind the US. But once the Financial Crisis hit, Asia eclipsed Europe, and at one point in mid-2009, Asia was just a couple percentage points away from the US. As the current bull market has progressed, the US has re-gained a sizable lead in first place, while Asia now sits solidly in second place. Europe, however, has been trending lower and lower…and lower. 5.More Positives for International Equities….U.S. Dollar Hits 4 Month Low. Dollar approaching 200day moving average to downside. The U.S. consumer may be healthy, but auto loans aren’t looking so hot. Delinquencies have picked up and some pools of asset-backed securities are deteriorating, reports Morgan Stanley in a Friday report. One reason is that auto lenders had loosened their standards in order to move vehicles and now they are tightening them. 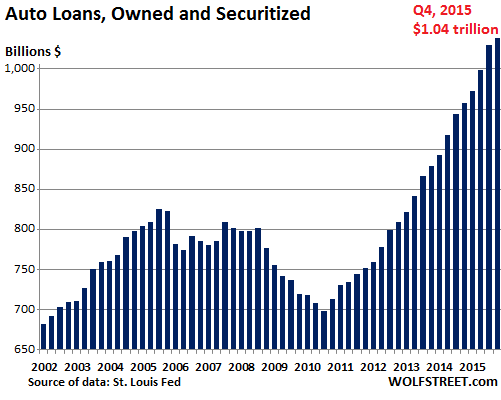 Another reason is that the securitized loan market is shifting to be more weighted to subprime issuers, find strategists Jeen Ng and James Egan. Since 2012, 60+ delinquencies of non-deep subprime deals picked up from 3.03% to 3.92%. While that 89 bps increase certainly demonstrates deterioration, it pales in comparison to the over 300 bps increase coming from these deep subprime deals. 7.Peak Student Loans? 1 out of 6 not Paying Back Federal Loans. The number of defaulted federal student loans hit a new high in 2016: about 8 million borrowers have given up paying on more than $137 billion in education debts. That means at least one out of every six people who have any federal student debt haven’t made a payment on their loans for at least nine months, says Jessica Thompson, research director for The Institute for College Access and Success. In fact, 1.1 million student borrowers defaulted for the first time in 2016, according to data released by the U.S. Department of Education on Friday. Overall, the total amount of defaulted federal student debt grew by about 14% in 2016. The new record surprised and disappointed Thompson and other experts who had hoped improvements to the economy and to student loan payment options would have had a bigger impact. After all, the economy and job market appeared to be strong in 2016: The national unemployment rate dropped from 5.3% in 2015 to 4.9% last year. A spokeswoman for one of the companies that handles billing federal student loans pointed out that the federal loan data also contained some encouraging signs. And the number of new defaulters has fallen slightly even as the number of borrowers who enter repayment (because they have been out of school for six months) has climbed steadily. That indicates the percentage of new repayers who are defaulting is falling, she said. Despite the decline in the rate of new defaulters, Chopra said the total number of new defaulters has risen because the number of new defaulters was higher than the number of people who managed to get out of default by restarting payments. 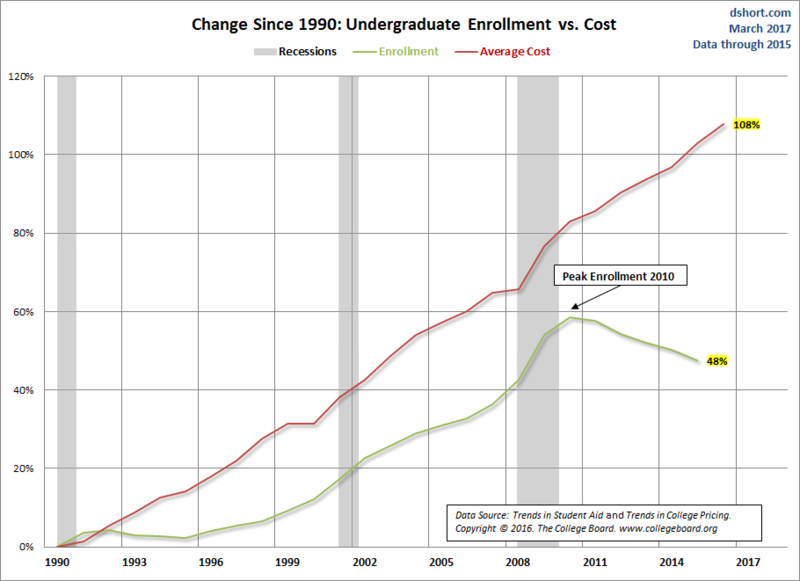 Some argue that rising student enrollment over the decades has led to the higher costs of education, but the two charts below suggest otherwise. The number of students enrolled today is about 50% more than what it was in 1990, while the cost of tuition has more than doubled. The rise in student financial aid was much more rapid than enrollment and the aid per student has risen tremendously. Cost figures are for tuition only and for one year. Each SAM can be rented at a monthly cost of ~$3,300 according to The Sun. With an average efficiency of 3,000 bricks per day, that breaks down to about 4.5 cents per brick. Meanwhile, using using Bernie’s preferred $15 per hour minimum wage rate, plus benefits, and a daily efficiency of about 500 bricks brings the human labor cost equivalent to roughly 32 cents per brick, or a little over 7x. 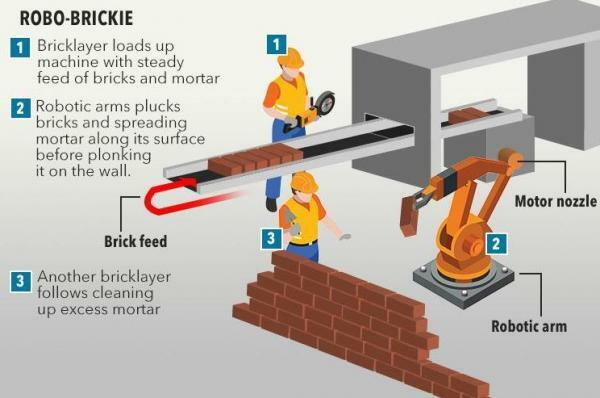 Of course, SAM can’t completely eliminate the need for masons on work sites just yet, as human assistance is still needed to load bricks and mortar into the system and to clean up excess mortar from joints after bricks have been laid. That said, Construction Robotics estimates that overall labor costs for bricklaying projects can be reduced by at least 50%. 9.The Pace of Income Growth is Still Lagging Behind Property Prices…Leaving the Rental Market in Lead. The pace of income growth is lagging behind that of property values. Combined with the sting of higher asking prices, affordability constraints mean rental demand will remain robust, allowing investors to maintain a solid foothold in the market, according to Lawrence Yun, NAR’s chief economist. The median price of a previously owned home sold in February was 7.7 percent higher than it was 12 months ago. 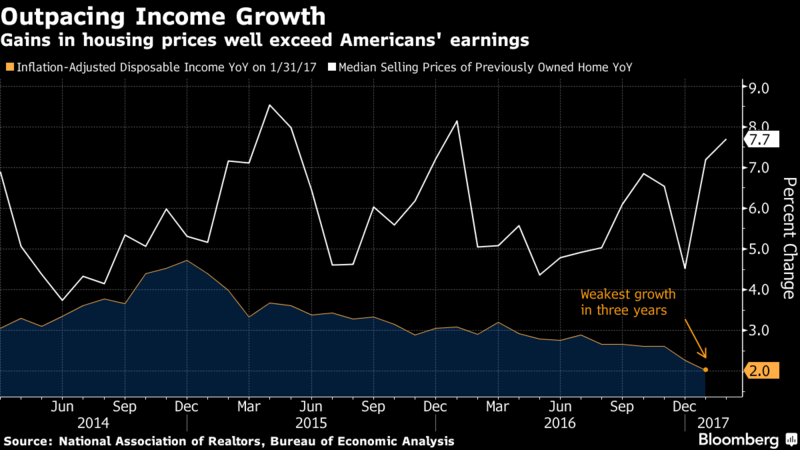 In comparison, after-tax household incomes, adjusted for inflation, were up just 2 percent year-over-year in January, the weakest gain since 2014. Higher borrowing costs aren’t helping either. The average nationwide 30-year fixed-rate mortgage stood at 4.23 percent in the week ended Thursday. That means the monthly payment for each $100,000 borrowed would cost almost $50 more than it did as recently as October, when the rate was 3.42 percent. Use your influence to lead others in a positive direction. Let’s be honest, it takes more than knowledge, position, and popularity at work to convince people to see things your way. It takes the power of persuasion. If you want to succeed, you have to be able to persuade and influence others. It doesn’t matter how smart and skilled you are–if you don’t know how to persuade and influence others, you will eventually become irrelevant. People will overlook your ideas and stop listening when you speak. You don’t need to be the boss to be persuasive. Getting results depends not so much on your position, but on your ability to garner support from others and being able to persuade others to buy into your way of thinking. Indeed, persuasiveness in the workplace–and in life–is such a coveted skill that people read books, take courses, and attend speaking classes to get it. Being persuasive doesn’t mean that you have to be a dictator. Being considerate and listening to other people’s ideas means trying to understand where others are coming from. That, in turn, makes them like you, and relate to you more. They will be more likely to consider your ideas instead of putting up a defensive wall. Don’t just listen to other people–be supportive, and give them the chance that someone else gave you. Validate others’ ideas, give credit where it’s due, share the success with others, and recommend others for positions as well. They will be more likely to pay it forward for support towards your ideas. Don’t just focus on your own goals. Make the time for the goals of others, too. Build your credibility through expertise. You have the proper training for what you do, so keep up on your certification if necessary, stay up-to-date on new courses, and make connections with others in the know. You need to prove yourself knowledgeable through your work so you can be trusted to make good decisions. Use compelling evidence. Back up all of your assertions with proof, which you will get through research and credible sources. Have citations for all written proposals and be prepared to provide statistics. Connect with others on emotional levels. Facts are great, but they aren’t the be-all-end-all in many cases. Persuasive people show their own emotional commitments to the positions they advocate, and can also relate to others and their arguments. Don’t be entirely unbending and dictatorial. Often, people want to know that plans are flexible enough to respond to concerns before they allow themselves to be persuaded. When collaborations happen, and several minds contribute to make a plan better, the result can be vastly better than the original proposal that the persuader was trying to pitch. Compromises can lead to better, more sustainable, shared solutions. Understanding the role that communication, listening, and skills play in the workplace will make you a more persuasive leader. Do you have a project or goal coming up that could use the help of a team? Use these tips to grow your group of business acquaintances to help you get the job done.